25 years seems like a long, long time; but when looking back it’s amazing how quickly the time has flown. The digital changes we have experienced and kept up with at Mac Print in the fields of printing equipment, technology and technique, are incredible. 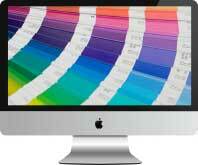 Mac Print was incorporated in 1991 and after 25 years we are still learning, growing and going stronger than ever. Our first computer can still be seen at Mac Print. It’s a “Mac SE” purchased in 1989 with a 9” black and white screen, 4 MB of ram, and a 40 MB hard drive; powerful stuff in it’s day, but a far cry from today’s 27” iMac wonders. Back then, black copiers made 8 copies per minute; now, they produce 2 copies per second! Colour copiers in the past ran 4 copies per minute; now they do just over 1 copy per second, staple & fold, hole punch and everything but make coffee. With wide format; we thought printing 11” x 17” was a big deal, but now we can print 42” wide with photoquality, almost all the way to Oxdrift in length! second to none at getting the job done! In 25 years at Mac Print, we have produced a wide range of printing for our clients; from a single black copy, to large and sophisticated projects, like the Dryden Life magazine that you are reading. Whether it is a small or large printing project, your business has been, and is always, greatly appreciated.